What could be better than bite sized, chewy, peanut butter bites? Dipping them in chocolate! The bites themselves have no added sugar and travel well, so pop a few in your bag for a great, grab and go snack! Do you know what the best part is about a holiday being over? DISCOUNT CANDY! Besides the fact that I am 100% convinced that holiday themed candy tastes better than the every day, regular version candy. 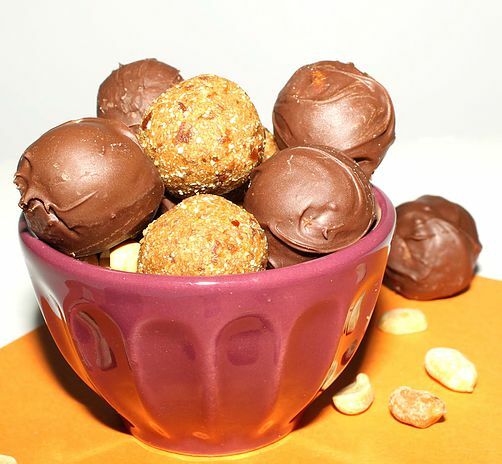 These quick and easy, no-bake bites get their sweetness from dates instead of refined sugar, so you are also getting a healthy dose of disease fighting antioxidants. And while the powdered peanut butter can definitely be substitute the with a regular, natural peanut butter, by using a powdered peanut butter you are also cutting down on the calories and fat, while still getting the great peanut butter taste! These bite-sized beauties taste perfect all by themselves; however, coating them in chocolate makes them like a much healthier Reese’s, and if I can feel good about eating a Reese’s, I’m going to opt for that! 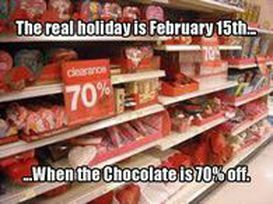 But, don’t let the chocolate limit you. 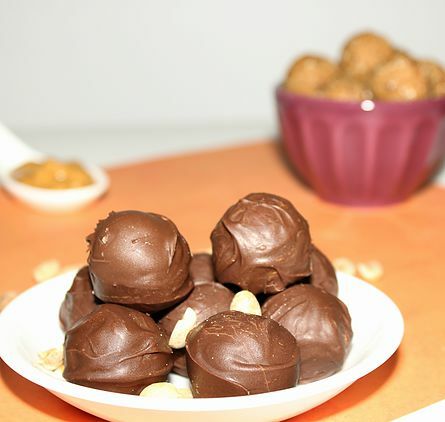 These chewy peanut butter bites can be coated in anything you’d like. Try white chocolate, caramel, jams, or jellies – the possibilities are endless! Just be sure to share with me what you’ve come up with! In a food processor or blender, add the dates, peanut butter, flour, protein powder, and salt. Pulse until completely combined and smooth. Add the water and vanilla ext. Start with 2 Tbsp of water and pulse the dough again. If it’s still dry, add another Tbsp. Scoop out the dough using a 1 Tbsp spoon. Roll the dough into balls and set aside. Melt the chocolate (either in the microwave or a double boiler) until all the chips are melted. 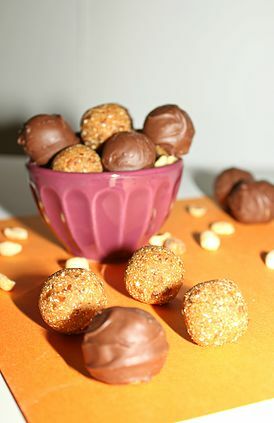 Dip each peanut butter bite into the chocolate to make sure it’s completely coated. Placed covered bites aside on a baking tray or parchment paper. Once all bites are covered, place them in the refrigerator for a few minutes to let the coating harden.